A Bangladeshi construction worker’s future is in ruins when he was left paralysed from waist down. A sum of $910,000 was paid to him to cover his loss of future earnings, the cost of having a full-time nurse, and other medical expenses. He now stays in a nursing home and need help with basic daily activities like bathing, eating and putting on clothes. People often neglect planning for their future. Ask yourself today, what if disability is going to happen, how is it going to affect my future? How is it going to affect my family, my love ones? 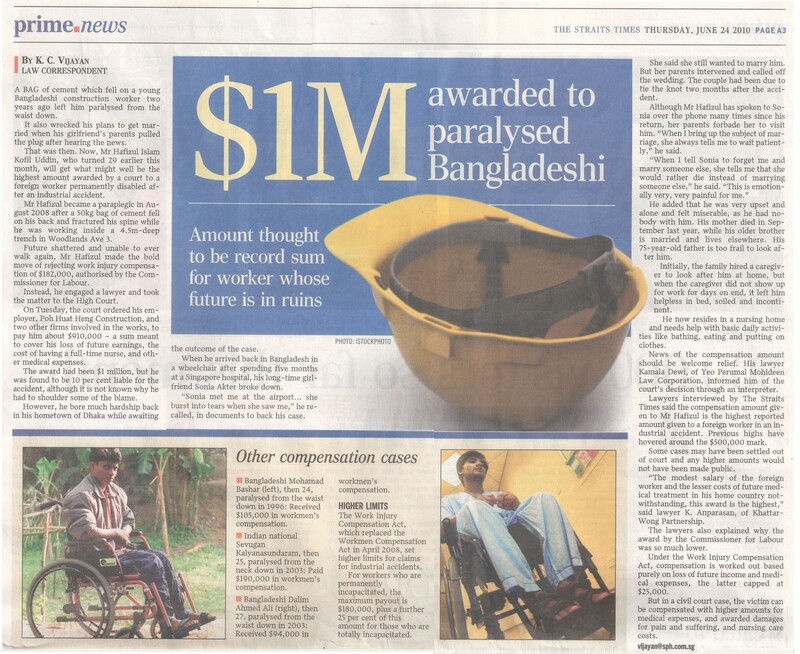 If a foreign worker require $910,000 to cover his loss of future earnings and all other expenses, what about you? Have you done any planning for your future? Learn about the concept of financial planning and how it impacts you. People living in or owning properties in flood-prone areas could pay more for general insurance in the future as underwriters review their risk exposure. 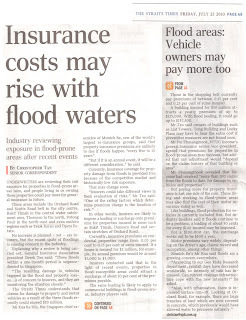 There are no planned increases but the recent cases of flooding are causing concern in the industry. Insurance premiums are unlikely to rise if floods happen every 5 to 10 years, but it will be a different story if it is happening every year. Claims for damages to property and motor vehicles could exceed $10 million as a result of the three floods recently. Income has received more than 100 claims from the floods for damage to properties and vehicles to date. Loading or surcharge on premiums are likely to be impose by insurers for properties in areas like Bukit Timah, Dunearn Road and certain stretches of Orchard Road. Properties in flood-susceptible areas could attract a surcharge of about 10% of the premiums payable. 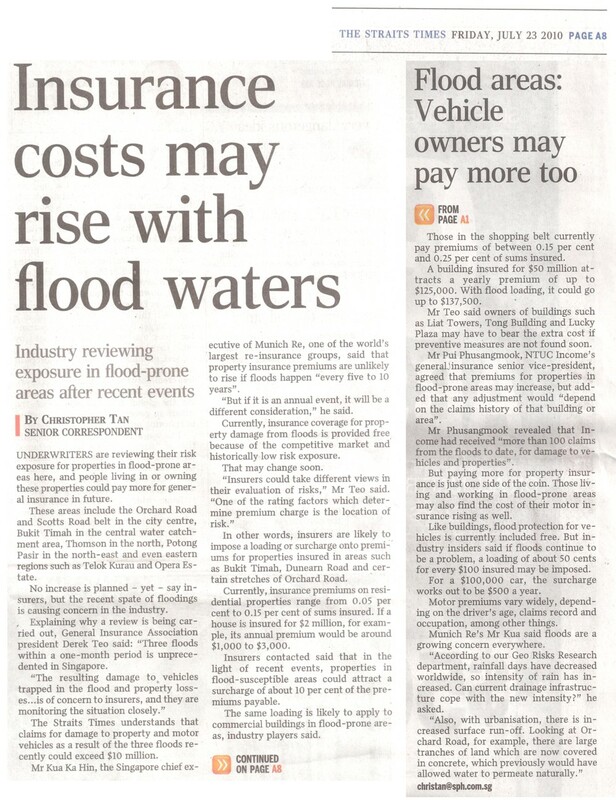 Cost of motor insurance may also rise for people living and working in flood-prone areas. If you pass all the money of the affluent to the middle class and the poor, who would have it in 20 years? The answer is the rich and most of their wealth will be back with interest. The rich are not smarter or more deserved; they just know how to recover it. The rich tend to do a better job of managing what they accumulated. Learn to think and invest like the rich, then let time provide the transportation to bring you to your wealthier future. You will be wealthier over time if you make time your friend, not your enemy. It’s not the honey, money or talent that makes the rich wealthy. It’s the way they think about financial matters that make their capital grow. The number-one retirement plan in Singapore is to win the next TOTO or 4D. Consumers spend more time packing undergarments for a weekend getaways or vacations than they do planning for their financial futures. Are you racing towards retirement faster than the rate your retirement savings is growing? Now that you've decided to save, and found out where you can put your money more effectively, here are a few things you need to remember when you're trying to accumulate your wealth. If you're buying an endowment policy for both its insurance and saving capacity, it is important to note that the insurance element is less and not necessarily adequate. If you're intending to capitalise off high projected returns, it is important to note that they may not materialise and to assess whether you can bear the brunt of possible losses. If you're going to limit the loss on your principal, then make sure the plan is capital guaranteed. Regular premium endowment plans may not always be capital guaranteed. If you're going to need more cash and ensure more liquidity, then picking a plan that provides regular cash payouts is a better choice. If it's retirement that you're considering, then a longer tenure and a lump-sum payout type of plan are what you should be considering. If you're unsure about where to start, it is imperative to seek professional advice from a financial adviser. It is important to pick a good financial adviser and one who is able to be objective. It is equally important for you to be forthcoming with relevant information for the adviser to work with. If you're going to start buying policies, it is a good idea to buy them from different insurance companies instead of just one, in case the insurer is exposed to problems. Risk appetite: The ability to stomach price volatility. Staying out of riskier investments is advisable if you have a low tolerance for temporary losses in your capital. Risk capacity: Separate from your appetite, the reality of your financial condition should shape your decisions. If you have outstanding debt, doubts over your job security or high levels of expenditure, then your risk capacity is limited. Time horizon: The more time you are prepared to remain invested, the lower your risk of realising a loss. 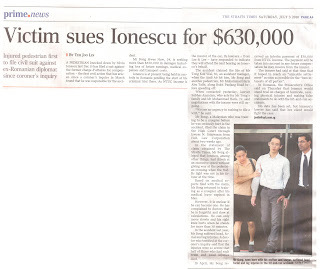 This article was first published in The Straits Times. FOR most people, the 'age of retirement' is about 65. While some plan to leave the workforce earlier, others often realise they will need to continue working longer than planned. But people generally calculate 'early' or 'late' from a mile-marker of about age 65. Unfortunately, this type of thinking encourages too many people to view retirement as a one-size-fits-all event - and that couldn't be further from the truth. Retirement is a highly personalised lifestyle change that requires careful attention and good decision-making skills. Retirees need to live on assets they have accumulated during a lifetime of work, and those assets cannot be easily replaced if any costly mistakes are made. What are my investment goals? How long do I have to invest? How long do I expect to live in retirement? How much risk am I willing to take? Your investment goals will depend on how you plan to spend your retirement. If you don't have a clear idea just yet, consider your current lifestyle and your dreams. This will help you formulate an investment goal, which you can adjust as retirement age approaches. Next, determine how long it will be before you retire - your time horizon. Generally speaking, the longer your time horizon, the more risk you may be able to accept in exchange for potentially higher returns. If your time horizon is relatively short, you may not want to accept as much risk. The toughest part of investing for retirement is the discipline it takes over the long term to build a large enough nest egg to enjoy happy and fulfilling golden years. It requires you to stick with an investment strategy that exposes you to the possibility of loss, which can be a bit unnerving at times. However, there will always be risk in financial markets, so meeting your retirement goals will force you to take an honest view of your own willingness to tolerate risk, to have reasonable expectations regarding market performance and to invest consistently for the long term. If you are nearing retirement, it may be time to do some specific thinking about what your retirement years will look like and how you will use your personal savings and other income sources to fund them. During our working years, the primary financial goal we should all have is to focus on accumulating assets. Once we retire, the focus is on how to use those assets wisely. In short, every decision you make about your retirement lifestyle will affect your retirement assets. It pays to think about dividing your retirement savings into three distinct pools of capital and to have the right investment strategy for each pool. Certain expenses during your retirement will be essential for your everyday needs. Other expenses will be more discretionary - things you might consider lifestyle expenses. In addition you may have financial goals that extend beyond your lifetime, such as creating an estate for your children, grandchildren or a charitable cause. A complete retirement strategy recognises that each of these three financial categories - essentials, lifestyle and estate - can and should have its own unique investment portfolio. The fixed expenses of life such as groceries, housing, insurance, healthcare and taxes. Investment strategy: Consider an asset mix of 35 per cent equities and 65 per cent bonds to generate a prudent mix of monthly income and long-term growth. Those 'nice to have' things that make retirement more enjoyable, such as dining out, club memberships, travel or golf lessons. Investment strategy: Consider an asset mix of 40 per cent equities and 60 per cent bonds to enhance long-term income and growth potential. Creating a future legacy, such as an inheritance for children and/or grandchildren or a gift to a cause that matters to you. Investment strategy: Consider an asset mix that includes 40 per cent equities or more and re-invest any monthly income to maximise long-term growth potential. 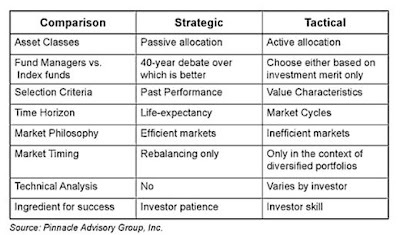 Despite the negative outcomes we have all experienced during the past year, strategic asset allocation remains the foundation that helps lead to long-term success in reaching your financial objectives. Don't let 2008 dampen your commitment to strategic asset allocation. Financial turbulence is an integral part of the functioning of capital markets. There will always be some form of crisis that will derail the financial markets every so often. History has shown that financial markets are resilient and will always recover strongly and continue their upward trend. This is why it is important that, as an investor, you do not make hasty decisions that will affect the performance of your investment portfolios - financial markets will return to their normal state. Without a doubt the recent financial crisis has taken a toll on investing philosophies. Traditional instruments of diversification - namely, emerging markets, international developed equity and US equities all under-performed US Treasuries in 2008. But the pendulum is swinging back. Many of the 'losing' asset classes in 2008 have historically performed well - and are starting to reward us again. The areas that suffered the most in 2008 are also recovering well. The other thing that should not change, regardless of whatever financial crisis we may experience, is our lifestyle goals. Retirement, children's education, buying property, etc are long-term aspirations that should not change because we are going through a crisis. Hence, we should not overhaul our investments and put these lifestyle goals at risk. Adjustments may be needed, but strategic allocations should not change. What happens in the financial markets today or the next few months should not affect our plans for the next 10 years or more. When it comes to investing, a diversified approach across asset classes, markets and managers will cushion us against the impact of market cycles, volatility and corporate failure, like Lehman Brothers, for instance. Investing is also about managing downside risk, as the greater the fall, the bigger the gap you need to fill to recover to pre-crisis level. Home bias is another factor you need to remove from your investment portfolio, as most people are very comfortable with over-weighting their portfolio in their home country and overlook the benefits of global investing. For example, many people are underweight in US equities at the moment, but the valuations in the US are more attractive right now relative to, for example, Asian equity markets. Finally, remember to stick to your strategy. Once you have your retirement goals and plans in place, it's generally best to stick with your strategy - even if the markets go down. Unless your life situation changes, you will likely be better off sticking with your strategy than moving in and out of investments in pursuit of better returns. This doesn't mean, however, that you should set your investment strategy in stone. You should regularly evaluate your investment decisions and adjust them accordingly as your needs change and your time horizon grows shorter. 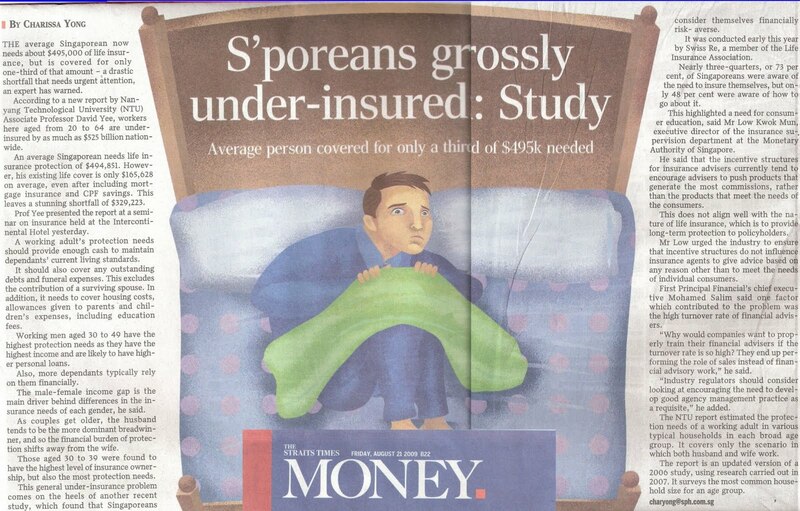 Singaporean need an average of $495,000 of life insurance but most only have one-third of that coverage ($165,000), even after including mortgage insurance and CPF savings. There is a shocking shortfall of $330,000. One should provide enough cash from protection needs to maintain dependant’s current living standard, coverage for any outstanding debts and funeral expenses should also be included. Furthermore, it needs to cover housing costs, allowances for parents and children’s expenses, including education fees. Men aged 30 to 49 have the highest protection needs as they tend to have the highest income and are prone to having higher personal loans. Thus more dependants are relying on them financially. 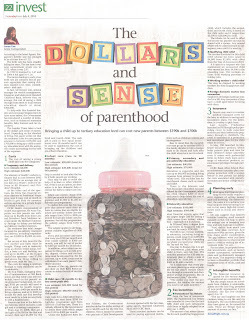 Labels: Newspaper/Magazine Articles, Why Insurance? Most of us give thoughts on life expectancy and wish for longevity and a bright future. Some people just have better luck than others. They just happen to be at the right place at the right time for good things to fall onto them. Some just inherit magnificent genes like high metabolism rates and they can just eat and eat without putting on weights while other can gain weight just by drinking water. But whether you are lucky enough to have good health or otherwise, having term life insurance appears to be a good investment. I will not debate the pros and cons of “whole” versus “term” life insurance as they are financial tools designed differently. Many of us obtain a term life insurance policy from our job and some don’t even know about it. No amount of money can replace the loss of a loved one, but knowing that the check would provide some financial security can provide disaster from getting worse. Term insurance bring not just financial security. It represents good planning and can be symbolic of being a well-prepared and planned person. It falls into the same category of having good lesson plans, being prepared for emergency situations, having a roadmap of goals and objectives, and lastly, knowing that you can sleep peacefully at night when you have done your best to be prepared for the future. In short, it is being responsible to yourself and others. So buy term life insurance. It can bring peace of mind. Of course, hope that your term does not come up. Monthly contributions to CPF goes into three accounts. Medisave Account for hospialisation expenses and approved medical insurance. A retirement account will be set up when you reach age 55 by combining ordinary and special account up to the prevailing minimum sum. CPF savings will be distributed to family according to intestacy laws if no nomination is done after death has occur. If there is a wish to cover item 1 and 2, it can be done with a will, if not they will be distributed according to intestacy laws. DPS proceeds can also be covered by a will, however the DPS policy is under NTUC, you can opt to nominate under the Cooperative Societies Act. Property depends on holding status. If the property is joint, it will be pass to the remaining surviving owner. If not it will form part of deceased estate. CPFIS are options for CPF member to invest their CPF savings. 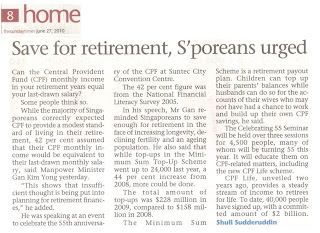 First $60,000 of combined CPF account earns an extra 1 percent interest, thus to enable members to earn extra interest. CPFIS can only be done after setting aside $20,000 in Ordinary Account and $40,000 in Special Account. CPF balance is protected from creditors. However, any investments from CPF savings will not be protected from creditors upon death. If there are creditors, you might want to liquidate all CPF investments before death so they are transferred back to CPF and protected from creditors. CPF nomination can be done by filling up a nomination form which can be obtained on CPF website. 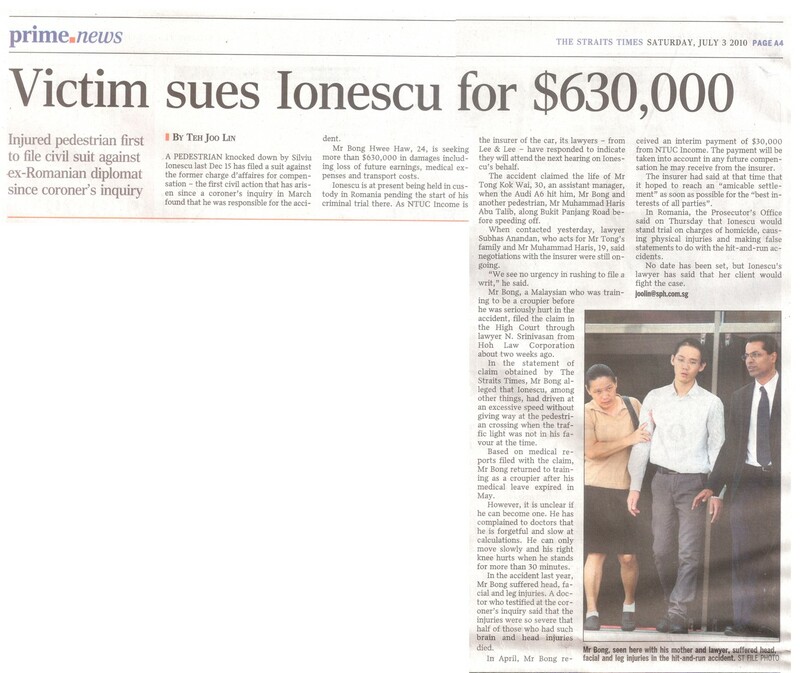 A pedestrian is seeking more than $630,000 in damages including loss of future income, medical expenses and transport costs against Silviu Ionsecu in a civil suit. It is one of the most overlooked elements of financial planning. Yet, it is one of the most important areas. Some might disagree, arguing death is a certainty for all of us but disability is not. However, it is not just the case of one ceasing to be an income-generating asset to the family, the person sudden change from an asset to a liability. Cost for diagnosis, treatment, and ongoing care adds up quick. No one thinks that disability will affect them. Yet everyone knows at least one person who has suffered from a heart attack, lived with cancer, or undergone a period of surgery. Car accidents happen on daily basics. Whether it is due to accident or sickness, risk of disability is always present. Financial planner plays an important role in bringing awareness of this need and assists people in planning for continued income. Bringing a child up to tertiary education level can cost parents between $190K and $700K. On average, it cost stands at about $300,000 to see a child through from birth to local tertiary education. The single largest cost comes from tertiary education especially when it is overseas. Thus, it is importance to start planning as soon as possible through a discipline and systematic way. The amount required to set aside on a monthly basics will be smaller if you start early. 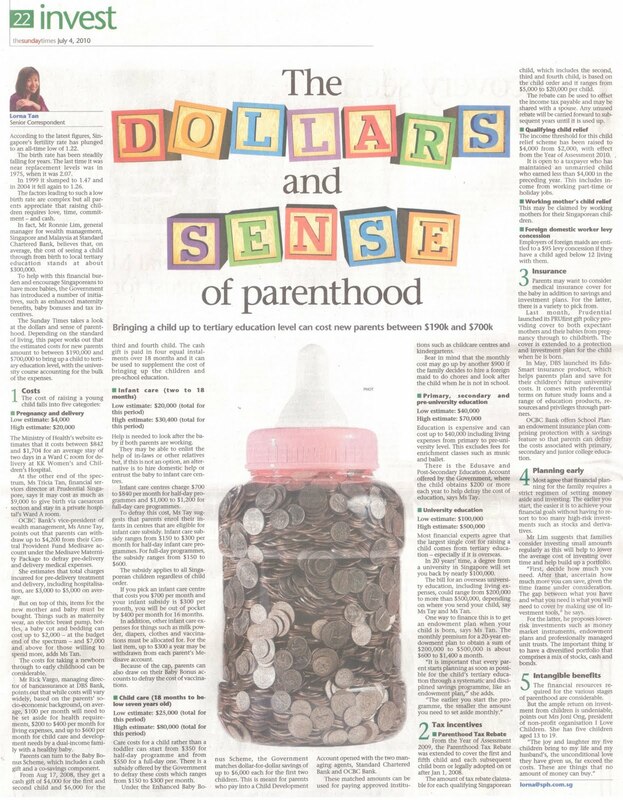 Financial planning is about having s strict regimen of setting money aside and investing. It will be easier to achieve financial goals when you start early because you would not need to rely too much on high-risk investments like stocks or derivatives. Families are encourage to invest small amounts regularly since it can help to lower average cost of investing over time and help to build up a diversified portfolio that comprises a mix of stocks, cash and bonds. Financial resources required to raise a child is substantial, but no amount of money can buy things like the joy and laughter which children are able to bring in life. They far exceed the costs. 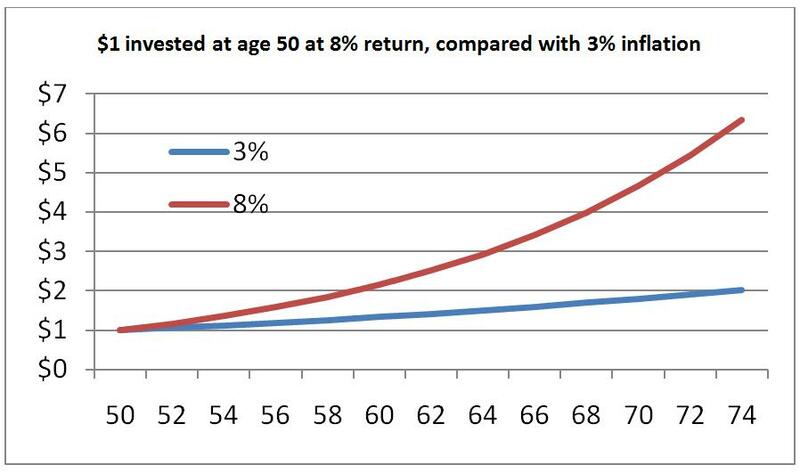 Investor might not reach his retirement goals even if the return for expected average long-term portfolio is met. 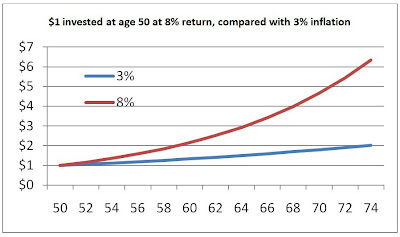 This is because it is not only the magnitude of returns which matters; it is also the order of the returns that matter. An investor’s financial goal of a 20 year portfolio return of 8% may not be achieved if they earn 0% for 10 years and then 16% for the next 10 years. Retirees should focus on whether or not the stock market and their portfolio is likely to deliver needed returns over a specific time period, which happens to be the first 10 years of their retirement. 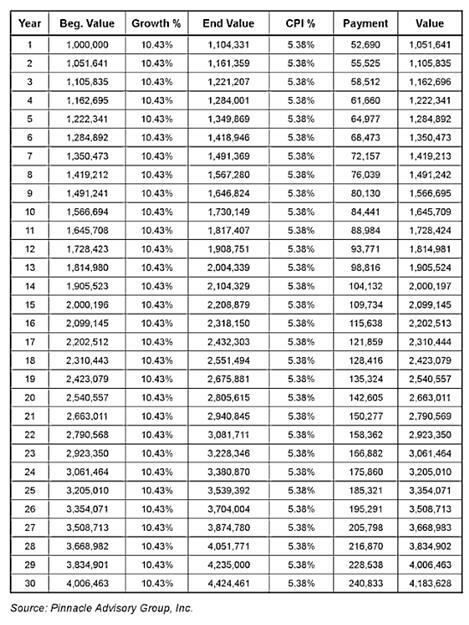 The table below is a simple illustration of a 30-year retirement scenario where the portfolio is valued at $1 million during the first year of retirement is there is a payment of $50,000 (5% of $1 million). Portfolio is growing at 10.43% each year and the payment to maintain lifestyle with inflation which is assumed to be 5.38%. Therefore, the absolute return is 5.05%. There seems to be little risk that the retiree would run out of money with the withdrawal growing with inflation. Retirement withdrawal during year 1 of $52,690 grows to $240,833 during year 30 with the initial $1 million portfolio growing to $4,183,628. But what if the scenario is different? The table below shows that the portfolio still earns the same average annual return of 10.43% over 30-year period like the above example. Inflation is following the actual yearly change in CPI for the 30-year period starting from 1966. 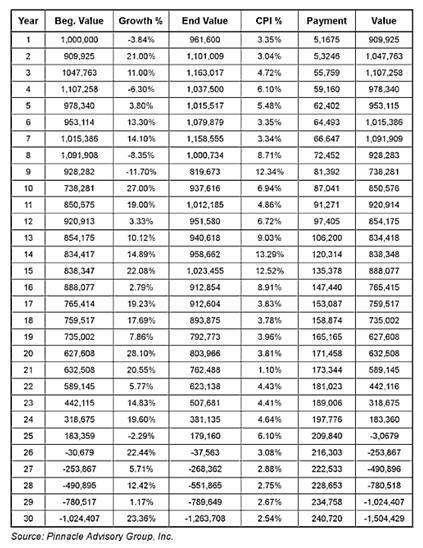 Even though this portfolio has the same average portfolio return and inflation rate for the period as the first table, the results are startling with the value of portfolio decreasing in value after year 15 of retirement. By year 20, portfolio value fell to $632,508. What do you think the 60 year old retiree who is now 80 years old be thinking when their projected value in year 21 was supposed to be $2.79 million dollars but is actually $589,000? This is a very good example of how one calendar year where portfolio delivered a negative return can blow up in year 25 of the retirement plan. It is the order of the return, not the magnitude of the return that matters. Because the retiree experienced less than expected returns in the early years of his retirement, the retirement plan was doomed to fail even though the returns for the last 20 years of retirement was outstanding. You may never be able to retire by using buy-and hold-investment strategies in bear market. However, the biggest risk an investor can make is to not own stocks, because stock market offer investors the highest real, or inflation adjusted, rates of return over long periods of time, typically over 10 to 20 year time periods. Investors will feel they are a genius in a bull market where asset values are rising during these highly profitable periods. Investors should avoid buying overvalued assets. Overvalued assets will not deliver average annual returns to investors in a time horizon that is short enough to help them achieve their financial goals. There are two unbreakable rules of managing risk, diversify and don’t buy overvalued assets. These two rules are simple, but investors don’t find it easy to follow and using them to construct their portfolios. The problem with diversification is correlation. A well-diversified portfolio has assets that have a low correlation to one another so they don’t move during the same time in one direction. The problem with valuation is that market valuation is a poor market-timing device. Markets tend to “overshoot” their fair values both to the downside and upside, making valuation a difficult tool for investing for any time frame other than the intermediate term which is 7 to 10 years. 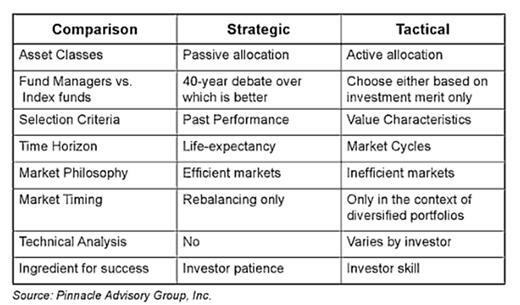 Be a tactical investor rather than a strategic investor. Tactical investors believe in both diversification as well as fundamental assessments of market values as the best means to manage risks. 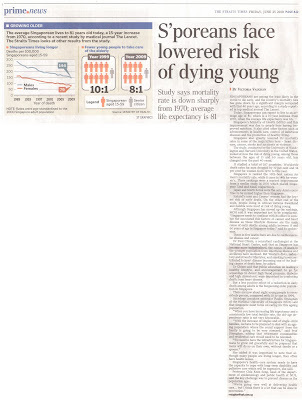 Singapore’s mortality rate went down significantly as Singaporeans are less likely to die early. Singaporeans today have an average age of 81, which is 15 years more than 1970 when it was 66. 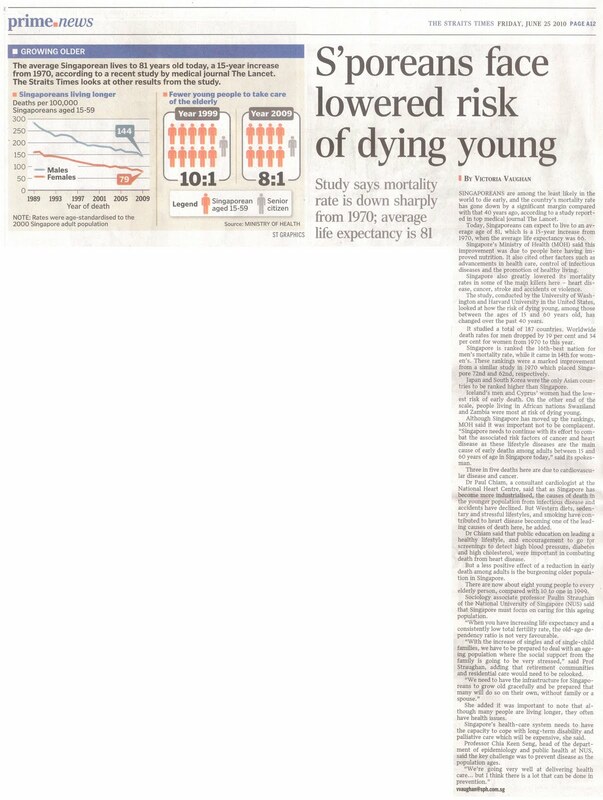 Factors such as improved nutrition, advancements in health care, control of infectious diseases and promotion of healthy living lowed Singapore’s mortality rates. The only Asian countries which ranked higher than Singapore are Japan and South Korea. With people living longer, health issues are getting more important. Long-term disability and palliative care will be expensive. With the increase of singles and of single-child families, we must be prepared to deal with an ageing population where the social support from the family is going to be very stressed. If you have not done anything for your retirement, now is a good time for you re-look into it. Singaporeans are being reminded by Manpower Minister to save enough for retirement in the face of increasing longevity, declining fertility and an ageing population. 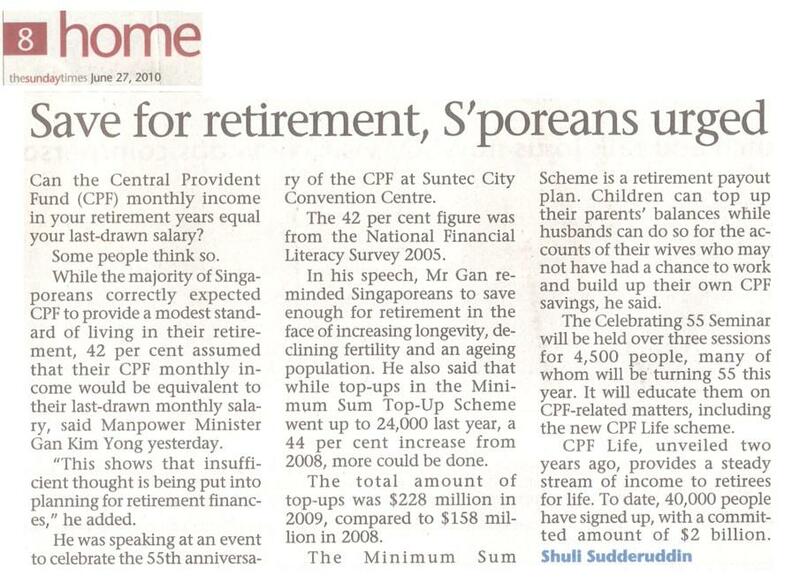 Insufficient thought is being put into retirement planning if assumption that CPF monthly income would be equivalent to last-drawn monthly salary. 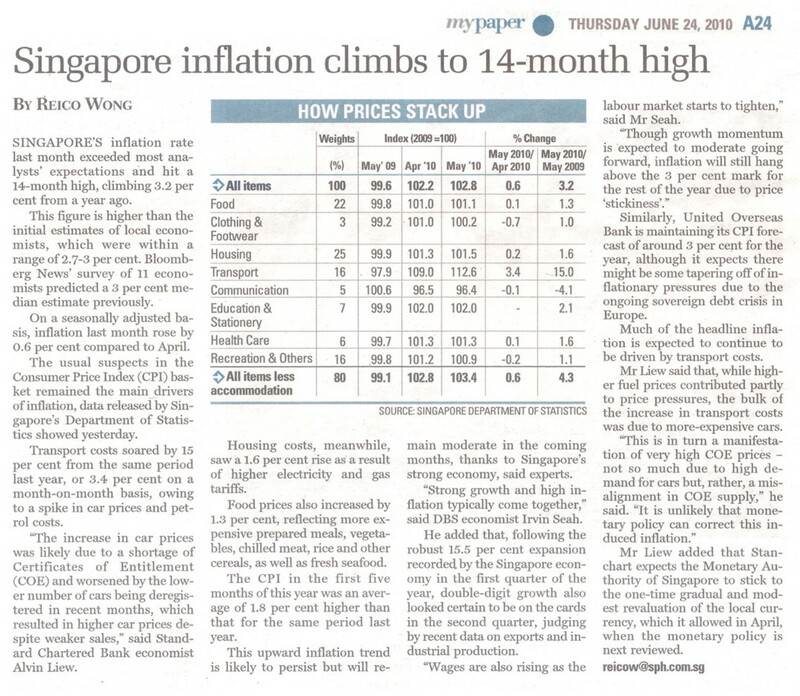 Singapore’s inflation rate hits a new high. 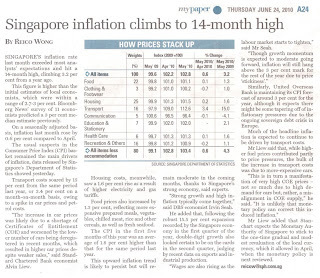 Upward inflation trend is likely to stay and is expected to continue due to transport costs. Savings being eroded by inflation? To prevent this from happening, your investment has to earn more than inflation. From 1961 to 2009, inflation has averaged about 2.74% per year. Assume the inflation is at 3%, one person will need more than $2 at the age of 75 to pay for something which cost $1 at age 50. However, you will come out ahead if your investment is higher than the inflation rate. This means that if you assume your returns to be 8%, $1 dollar investment at the age of 50 will be worth $6.85 at age 75, which outpaces the effect of inflation. Let’s look things in a different point of view now. If you fail to take advantage of compounding, what is your opportunity lost? If you are 50 years old, for every dollar you spend now will deprive you of almost $7 at age 75 (at 8%). Which means one extra pair of shoe which you spend $90 on today will cost you more than $600 ($90 × $6.85) of retirement money. For a 30 year old, the opportunity cost will be much higher if he purchases the same shoe, it will cost him almost $2,900 ($90 × $31.93) at age 75 and about $6,200 ($90 × $69.93) at age 85.